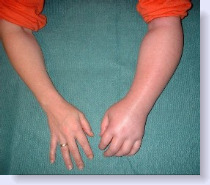 Not much is known about the perplexing condition called complex regional pain syndrome (CRPS). It appears to show up after a severe injury to the foot or hand, and is marked by severe pain that does not go away after the injury has healed. The condition also is marked by the pain spreading to the whole leg or arm, or sometimes even the whole body. The condition has mystified those in the medical community for quite some time, and many even thought the condition may not be real. Fortunately for sufferers, new studies have proven differently. Nearly 200,000 in the United States suffer with the condition. The following article discusses CRPS and overviews a study conducted by scientists at the Northwestern University's Feinberg School of medicine. The article gives details on the study and discusses the surprising findings of the study. Scientists found the white matter in the brain was significantly changed for those with CRPS – and that the areas related to skin temperature, pain perception and emotion were rewired and reorganized.